Directions DO NOT INSERT INTO EAR CANAL. COVER ONLY. DO NOT CUT, BREAK APART OR ELONGATE. 1. Make sure hands and ear opening are clean and dry. Roll whole plug into a ball. 2. Place plug over ear opening and flatten to form airtight seal. Avoid hair. NO! Do not insert into ear canal! To loosen and remove, press up behind ear. Discard when soiled or no longer sticky (up to 5 uses). 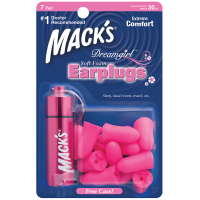 For best results when flying, wear earplugs entire flight. Made with non-toxic, hypoallergenic silicone putty. 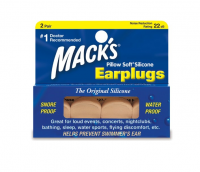 Do not cut, break apart or elongate earplugs. 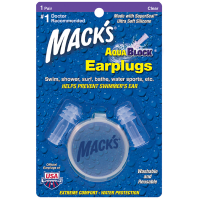 Uses Doctor's choice for sealing out water, reducing noise and for use with ear tubes. Snore proof. Water proof. Swim, sleep, study, shower, work, travel, sports, loud events, flying discomfort, etc. 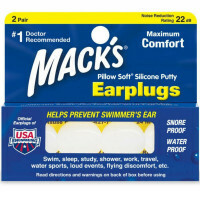 Helps prevent swimmer's ear. 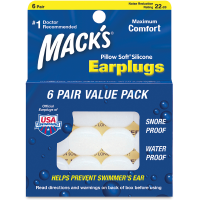 Noise reduction rating 22 decibels (when used as directed). 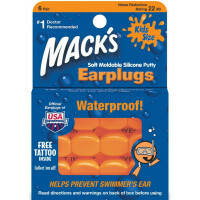 Warnings Use whole earplug. Do not cut, break apart or elongate. Cover only! Do not force plug into ear canal! If misused by failure to use as directed, earplug may become lodged in ear, which requires removal by an Ear, Nose and Throat Doctor ONLY. Adult supervision required for children 14 and under. Keep away from infants and small children when not in use. These plugs are non-toxic, but may interfere with breathing if caught in windpipe, which could lead to serious injury or death. Do not use for scuba diving or at depths over 10 feet. Use only as directed. In case of misuse call: 1-586-427-7205 for a 24 hour message.